The Nutrient Network (nutnet.umn.edu), now in its fifth year, is a collaborative experimental network established to understand the long-term consequences of global-scale changes in climate, nutrient inputs, and food web structure for grassland diversity and ecosystem functioning. Over 90 scientists conduct a standard set of observations and manipulations at ~70 herbaceous plant-dominated sites on five continents to develop a global perspective on the effects of multiple nutrients and herbivory on plant productivity and diversity. Sites span a wide range of short-statured vegetation types and environmental conditions and include six LTER sites (CDR, SEV, SGS, KNZ, HJA, NWT). 39 sites are conducting standalone experiments within a randomized-block design with 5 m x 5 m plots and 3 replicate blocks per site. The Multiple-Nutrient Experiment is a factorial addition of three nutrient treatments (N, P, and K + micronutrients). The Consumer x Nutrient Experiment (at 33 sites) is a full factorial manipulation of nutrients (Control or All Nutrients) and consumers (Control or Fenced). The 180 cm fences are designed to exclude aboveground mammalian vertebrates, including deer; small, climbing, or subterranean animals may potentially access plots. Annual data collected in all plots includes aboveground live and dead plant biomass and species and growth form composition. Here we propose to strengthen the LTER – NutNet partnership. CDR hosts one of the first NutNet sites and is in an advantageous position to support NutNet activities. CDR PIs Borer and Seabloom are the lead PIs of NutNet and several other CDR investigators are contributing to NutNet (Cavender-Bares, Hobbie, Kinkel, and Knops). Borer and Seabloom also host annual NutNet scientific meetings at UMN, and NutNet data are hosted on Minnesota Supercomputer Institute servers. NutNet also benefits CDR – and the LTER Network – by providing a global context for site-scale research on diversity, nutrients, consumers, and ecosystem processes. In addition, the highly standardized NutNet data can help in calibrating and synthesizing long-term datasets across LTER sites. To date, NutNet data have been the basis for cross-site syntheses on the drivers of plant diversity and invader abundance (Cadotte et al. 2010, Adler et al. 2011, Firn et al. 2011), analyses that have demonstrated the insights that this unique dataset can provide. For example, NutNet data revealed no globally consistent relationship between site or plot-scale productivity and plant diversity (Fig. 1; Adler et al. 2011). Similarly, they revealed that exotic species had similar abundances in their native and invaded ranges, suggesting that the same species traits or interactions controlled species abundance in invaded ranges as in home ranges (Firn et al. 2011). With five years of data in hand, the NutNet is poised to make major contributions to ecology; there are currently 15 manuscripts in preparation. We propose to support the centralized coordination, data syntheses, and data management that are essential for this network to gain insights into the global drivers of species distributions and ecosystem processes. For example, we will use the increasingly long-term and rich NutNet data set to examine the global relationships between grassland vertebrates, grassland productivity and nutrient cycling (Borer et al. In Prep) and the regional variation and contingencies in the susceptibility of communities to invasion. 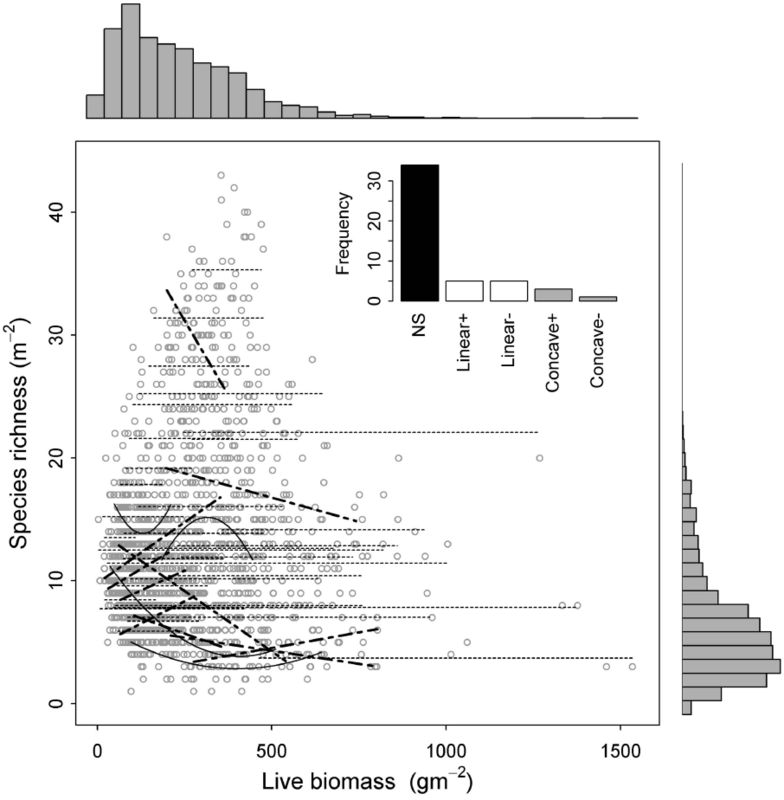 We also are using these data to assess global patterns – and suggest potential drivers – of nutrient limitation of decomposition (Hobbie et al. In Prep). We also propose to pursue NutNet-wide experiments. We are currently using CDR funds to evaluate the role of nutrient inputs and herbivory in decomposition of a standard substrate (pin oak leaf litter, Quercus ellipsoidalis) at 36 NutNet sites. Over 7000 litter bags were deployed in treatment plots in 2010, to be collected over seven years (2011-2017). We also propose to use NetNet to seek global-scale insights into the factors controlling soil organic matter via density fractionations, long-term incubations, and chemical oxidation at a subset of North American NutNet sites that have a range of precipitation (MAP), temperature (MAT), soils, atmospheric N deposition, and aboveground biomass. To determine site and treatment effects on soil C pools, we will aerobically incubate soils from 210 plots at 22°C in the dark at field capacity to measure CO2 evolution, density fractionation, and oxidation with H2O2 (Jagadamma and Lal 2010). Datasets for e247: Nutrient Network. A cross-site investigation of bottom-up control over herbaceous plant community dynamics and ecosystem function.